We go through a fair amount of wine and beer here at ARFE Headquarters. Lately, though, we've been thinking that maybe we should look at our consumption more seriously. Oh, we don't by any means think that we should taper off. We do think that perhaps we should make a more concerted effort to buy organic wines and beers, or maybe even wines and beers from vineyards and breweries that practice or encourage sustainable harvesting and farming. We took a look through our extensive beer collection and looked up the origins of each beer, and were pleased to see that much of the beer we've been drinking is, indeed, already organic. Call it fool's luck: We've been doing right by our booze choices and not even realizing it. Otter Creek Brewing Company has been making organic beer under its Wolaver's label for ages now. We first discovered this beer skiing in Vermont--and we're happy we did. We like its hoppy India Pale Ale for summer evenings after a nice trail run and its seasonal, full Oatmeal Stout for winter evenings in the hot tub after a good day of skiing or just throwing snowballs at someone you love. Otter Creek says that the otter is their mascot, and not just because the creek that runs through Middlebury, Vermont, right next to where their brewery is located is called Otter Creek. 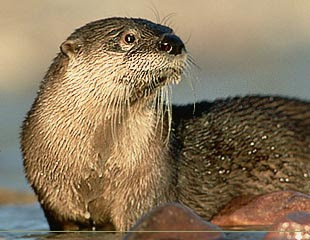 It's because river otters like to play and play and play...somehow, ARFE Management is regretting the day she threw the acceptance letter from Middlebury College into the garbage. Why, oh why? 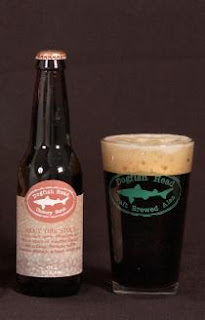 Then, another favorite Northeast brewery, based in lovely Rehobeth, Delaware, is Dogfish Head Brewery. They do a wonderful brew that satisfies two jones for us: a Chicory Stout that is made of organic coffee beans, St. John's Wort, chicory, and licorice root. We like the flavor, and we like the little coffee kick that goes with it. It's a seasonal brew, but that makes it something to look forward to every December. Even the big brewers are getting into the game. Anheuser Busch (stop that laughing right now. I mean it. Stop it) has two entries into this market, Stone Mill Pale Ale and Wild Hop Lager, were in test markets last we heard in July of last year. They're certainly not labeled as being from AB--you'll see them under the brewing label of something called Green Valley Brewing Company, "the organic brewery of Anheuser Busch." [That last bit is in the fine print.] We haven't tried the beer yet, although we will for the sake of research, and we are impressed by the company line on recycling, conservation, and energy use at the Green Valley Brewing facilities: 97% of their solid waste is recycled, and they're using their wastewater for several applicable uses. Of course, by far the best way to go sustainable and organic is to buy local and organic and sustainable. Our local brewery, Goose Island, is rumored to make an organic ale that we haven't seen yet. And Jim, our master's team captain, is from a fine place up north called Wisconsin. They make a lovely beer called Leinenkugel's there. We're waiting for them to come out with an organic brew. Perhaps the best option of all is to start homebrewing. We know for a fact that our friend Kevin makes his own brew. It's fine and heady, loaded with an alcoholic content bordering on 7%, but Kevin's since moved to Alaska--so he's not really local anymore. And our friend Mike grows his hops in his backyard in St. Louis, MO and then brews the stuff in his basement. That's pretty darned local, as far as we're concerned--we only have to drive 6 hours to get to Mike. That's a mere 4 days by bicycle if we put in century days. Boy, a nice Mike-brew would taste good, after that, wouldn't it? Chicago to St. Louis. Not very far according to this map. Ready the homebrew, Mike, we're coming in!